Fashion blogger Anooshe Mussarat, daughter of Pakistani bussinessman Aneel Mussarat made it official with her beau Mr. Edward Kissner at The Dorchester in London - and it’s one of the biggest, fattest Indian weddings we’ve seen this year! 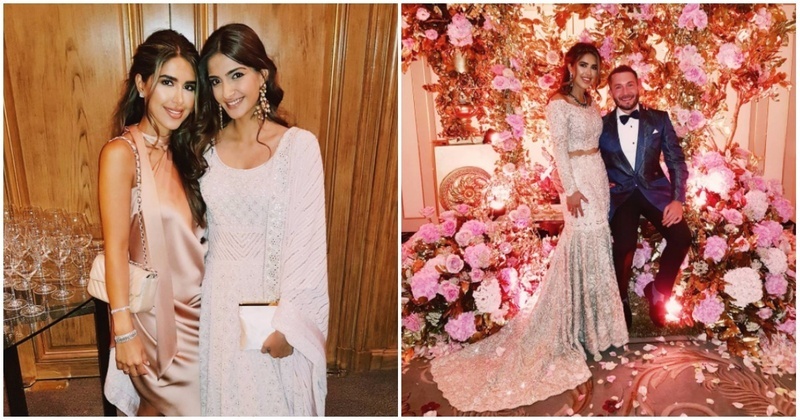 The wedding events that were spread over almost a week had some of Bollywood biggest names in attendance - Sonam Kapoor, Hrithik Roshan, Ranveer Singh, Karan Johar, Anil Kapoor, Suneil Shetty to name a *few*. For the wedding, bride Anooshe looked gorgeous in a white couture gown with a long train by Faraz Manan. On the registration night, she opted for a sleek Ralph and Russo number. Her weddind dinner had her grace the event in a Abu Jani Sandeep Khosla mirror-worked lehenga. Close friend Sonam Kapoor looked no less stunning in an all-white chikankari ensemble, keeping the look au naturel with soft waves and light make-up. If these gorgeous outfits weren’t enough, the venue was decorated in an elaborate setting of large peonies, candle-lit bouquets and the most expensive champagne (which only added to the already lavish ambience of The Dorchester). Instagram their wedding hashtag ‘kissmuss’ for more of Anooshe and Edmund’s larger-than-life wedding affair!